From: Discount Alpine Liquor in Alpine, Calif.
Was semi-looking forward to this beer. I definitely like winter warmer beers, but 21st Amendment has just been OK the few that I’ve tried. Plus I noticed the “Enjoy by Jan. 31, 2016” on the bottom of the can when I got home (I don’t think it was on the box), I’ll try to not let that affect my review. Single finger head with poor retention but nice lace on a near clear deep amber red body. Aroma is very sweet and well represented with nutmeg, cherry, mint and cinnamon, all spice really. Flavors of the winter season with more nutmeg, gingerbread, nutmeg and hint of peppermint. Some caramel malt base as well. A lot thicker than expected, moderate carbonation and fairly oily coating the palate. Very interesting with this one managing to have many of the same flavors as others in the class but the overall flavors and body make it different and therefore memorable. When cooler weather comes calling, so does the flock to indoor convening- hovering around the fire for bar banter and cosmos riddling. And the San "by God" Francisco brewery makes a beer for such the occasion. Fireside Chat opens with the common brown ale charm. Its dark chocolaty austere highlights its initial toffee, nutty and sweeter malt tones while aromas of butter pecan, walnut, chocolate and toast waft about. Spicy introductions are made upon the middle palate as the creamy but semi-dry ale balances that malt sweetness with the supple spices of coffee and allspice- lead by cinnamon. Yet as delicate clove and nutmeg round out the beer's juicy malt center, its bigger-than-usual taste and effects take hold. Drying alcohol and fleeting malt sweetness gives the ale a semi-sweet finish, creating crevices in taste that allow for the strong astringency from spice to balance the beer more so than hop additions. Those broad an woodsy hops are no match for the tannin-heavy unsettling that comes with those excessively boiled tea and spent coffee ground flavors. While the ale simmers in the glass like coffee- there's a lot of promise in its taste. Allowing the spices to join the process in more post-fermentation usage would have retained the delicate oils from the spices and without leaching its brash tannin. I got myself into trouble drinking pints of this at a pub, not knowing how strong it is on the alcohol, because it never shows it! A few of these and I was real loose, which is always fun. Dark brown it looks like a porter, but the roast on the grain is only medium, and there is very little bitterness. What bitterness is in here is balanced out by a brown sugary middle and a drying spicy finish that may include anise and clove. A darker take on the winter warmer, it's rich and satisfying in the feel, very full bodied and lightly carbonated. Surprised how drinkable it is, which is how I got wasted on it in the first place. I have liked all the beer I have had from these guys, cool they have wider distribution now. Not my favorite here, but is think it is underrated. Clear cola/brown body with coarse ambient carbonation, tan velvet solid fluffy head. The nose is warm, eliciting notes of rum, caramel, raisin, baking/Christmas spices, and bread crust. The taste is sweet, with bread crust, caramel, butterscotch, and mild cinnamon and allspice in the background. The bread crust aspect lends some bitterness and anchors the sweetness. Body is medium, pretty soft, with mild carbonation in the background. Great beer! The bitterness of the bread crust was too much of an anchor for me, but otherwise this was a great warming ale. The warmth and sweetness of the malt was great, the seasoning was in the right amount, and the alcohol was stealthy but potent. Top contender for all my Christmas parties. M: Thick, chalky, harsh, rough...I keep taking a small sip of this after every section of this review and...god this is just really bad. O: I’m extremely open minded when it comes to all beer, 99.9% of what I try that I’m not a fan of I can at least find something positive to say about it, and I usually end on an “I won’t buy it again but I’d drink it if it was offered to me” type of note. NOT fireside chat, I will never drink this shat again. It’s just not good, I’m not trying to be a jerk it is just a sincerely bad product. Appearance: Surprisingly clear, very deep mahogany brown body beneath a short head of creamy tan froth. The head drops readily to a standard collar along the sides of the glass. Lacing is made up of tiny spots, some larger drops, and the occasional stretch of craggy lace. Smell: Dark caramel and spice - no surprise there. Cinnamon is clear. Perhaps nutmeg, maybe ginger... nice. Taste: The spice is strong, but I don't think it's over-done. However, it does kind of build at the back of the throat unless you give it some time between sips. It's balanced within the dark, almost-burnt-sugar maltiness, and a surprisingly bitter back-bone. As it warms it becomes more chocolatey and round, softening the spice a bit more. Mouthfeel: Medium bodied and gently zesty on the tongue. Overall: Charming, festive, and warming. 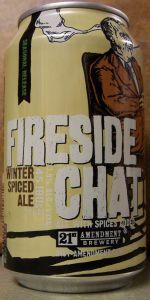 21st Amendment Fireside Chat use to be one of my favorite winter warmers....until this year. I am not really sure what happened, I can only speculate that they were shooting for wider appeal. Maybe they will get it, but I seriously doubt it. This beer is now a massive disappointment which is unremarkable in every way. Very average beer with no qualities worth seeking out, or that you can't find in other beers year round. Spend your money elsewhere. From a can, pours as clear deep amber with a tan one-finger lasting head. Aromas of cinnamon and nutmeg (remnant of eggnog) with caramelly malt. Taste is sweet malt forward with lots of spice notes (cinnamon, nutmeg, and clove) as you'd find in an eggnog. But it is a bit of a cacophony plus some metallic taste, so not world class. A - Poured a dark brown mahogany body with slight red or ruby highlights. Head was just shy of 2 fingers and was very frothy, creamy texture against some larger bubbles. Left a few streaks of lacing, and always appeared lively. S - Smell is very sweet and fruity at first with an immediate wallop of cinnamon and nutmeg, maybe some other things from the spice rack in there... very spiced smelling. The sweet fruity aroma is almost raisiny, with a thick bready malt note. Like some sort of overly sweet and rich holiday desert. T - Taste follows the nose but is engulfed in an astringent finish that swallows it up like a black hole. Nothing can escape the astringency... accept the cinnamon and the sweetnes. So yes.. no real malt, hops, just a drying astringent holiday cookie that was overcooked. On top of that, somehow in the face of massive astringency, the sweetness is just immense... I think cloying is a harsh word and I try not to use it in my reviews without some restraint... but this... this is cloyingly sweet beer. M - Thick, sweet but still astringent. O - This was neither refreshing, nor could it possibly perpetuate any fireside chat. Maybe I should smoke a cigarette like the guy on the can to add some flavor. Sorry for the diatribe, I often find myself liking most of the new beers I try. This one would be a drain pour if I wasn't committed to writing this review based on a fully drunken beer to give it the benefit of the doubt that it gets better as it warms. It doesn't. Pours a dark brown with reddish highlights. Head caps quickly, and the nose is dark malt with dark fruit and a little winter spice. Chocolate, caramel, leather, spice, smoke, baker's chocolate, prunes, and coffee in the finish. Relatively smooth as a sipper but I would prefer a thicker texture. Not worth looking out for again but not without its charms. Great artwork on the can. A - Poured out a dark burgundy color with a one-finger, tan head of white foam. It left thin wisps of lace on the glass. S - It smelled of traditional Christmas spices - nutmeg, cinnamon, etc. A mild caramel malt aroma, too. T - It tasted spicy - not hop spice but spices. Again, more nutmeg and cinnamon. A slight dried fruit flavor like figs and plums mixed with strong maltiness. D - I was glad to finally try a can from 21st and this was a pretty nice one. Loved the artwork and it was pretty tasty, too. From a can dated 10/18/16. Pours a nut brown color with a finger of tan head. Smell is sweet toasted malt. Medium feel. Taste is sweet malt at first followed by a rush of spices. Bit of a metallic aftertaste. Can from Winco. A pretty solid brew, I'm sensing an English ale under the spice bouquet. Cinnamon, nutmeg, vanilla all present, as accents, not overdone. Solid malt body carries it well. Body a bit thin, lets see where this goes with a little warmth. Pours a dark brownish red with a 2 inch khaki head that fades to a small cap. Foamy clumps of lacing on the glass on the drink down. There is some sediment/floating debris in the glass. Smells of dark fruits, cranberry, winter spices (cinnamon/clove), and fruitcake. This actually smells very good to me. Taste is of fruitcake with candied fruit/rinds, cranberry sauce, and the spices I mentioned in the smell. The taste is not as good as the smell. There is almost a medicinal aspect to the taste. Beer has low carbonation and it's somewhat hard to drink down due to the medicine tastes I am getting. Overall, I had this beer back in December and it was a lot better then. I think it's safe to say this one has degraded over time and is meant to be consumed ASAP. Notes are from last night. This beer pours a thick, dark brown. At first a big head forms from a very active cascade effect and leaves small patches of lacing at the very top of the glass as it recedes. Retention is fair, and it eventually leaves a pretty thick ring of head for the rest of the way, dropping behind some lace in thin patches. The nose is an interesting one to try to pick through. Cinnamon definitely seems to be in there with some nutmeg under a strong malt base. I think the fairly strong hops presence is what makes the aromas underneath a little more difficult to ascertain. I don't know if it's added or an aspect of the malts, but there's a bit of chocolate here as well. The taste follows suit, with everything mingling nicely at first,but I think the hops actually throw things off a bit in the flavor. I would think that for this to be great, it would need to be a more lightly-hopped brown ale or porter, something more along those lines. For this particular beer, the IBUs are a bit high and don't mingle as nicely as I'd like. There's a touch of sourness that comes through here too, but working through a mouthful I can get beyond it to appreciate a decent complexity and an otherwise good flavor. Each sip starts off fairly thick and gets a bit spritzy. Carbonation is moderate and the body is medium. I can appreciate this, but I'd move on before too long. It's a respectable offering from 21st, but for now I'll stick with their hoppier styles. A: Dark brown body; dark red when held up to the light. 1 finger light tan head, which receded rather quickly. A little lacing left on the glass. S: Spices, cinnamon, burnt sugar, ginger. T/M: Just like it smells! Tons of spices right up front, rounded at with a nutty brown ale type sweetness on the end. A little heavy on the carbonation for me, but as it warms it evens out. O: A very nice winter warmer style that is a nice accompaniment to a cold winter's night! Can easily enjoy a couple of these during the winter time on a snowy night, or day for that matter. 12 oz can with a Nov. 2016 canning date. Smell: spiced bread; intermittent off notes. Taste: Lightly bitter and moderately spicy. Light bready notes and spices linger on in the aftertaste. Mouthfeel: Full body. Medium+ carbonation. A little sticky. Overall: a dark spiced winter ale that is not over spiced. Color was a deep brownish orange. The tan colored head was creamy, had very good retention, and left a nice lacing on the glass. The first thing I noticed in aroma was the complex mix of spices. Although I couldn't identify what they were, they provided a nice introduction to the beer. Fireside Chat had everything I want in a holiday beer--a more pronounced malt profile, "warming" from a higher alcohol content, and something unusual thrown in the mix.